← What’s with Crystal Palace? Where does Ozil play? And will he be effective? After registering 25 appearances at CAM in Arsenal’s 4231 last season, Arsene Wenger has used Ozil as a LM in his two appearances for Arsenal this year. Being forced out wide hasn’t been the most splendid so far, as he hasn’t proven to be as effective as he was last season in his prefered central role. With Aaron Ramsey injured and Danny Welbeck likely to start at striker, we’ll have to see how Arsene juggles his midfield options. How will the City the midfield adapt with Fernando’s absence? Fernando was pretty fantastic in his first two games in his City career. His high motor and workrate had him all over the pitch against Newcastle and Liverpool and gave Yaya Toure the freedom he thrives on. Fernandinho will operate in largely the same role as Fernando, There’s no doubt that Fernandinho is a more than ample replacement for his fellow Brazilian but it isn’t unreasonable to say Fernando was one of the more important players on the pitch for City’s six points from their opening two matches. 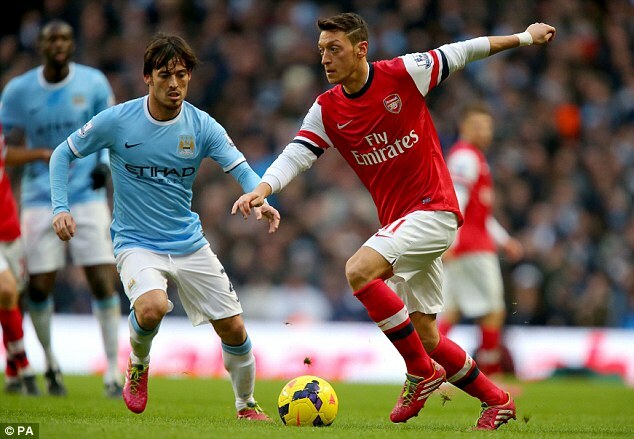 How can Arsenal get points against Manchester City? Even though City are on the road, they are still the favorites in this tie. Arsene Wenger’s abysmal record against the top sides of the BPL must be taken into consideration. Arsenal have won one game against the top four in the past five years, and although it is still early for predictions, I think it’s safe to say Manchester City will be in the top four this season as well. The key to beating City is to isolate their defenders against pace – it’s easy to find Kompany out of position and Demichelis isn’t the quickest defender in the world at this point. In Alexis and Danny, Arsenal have the artillery to achieve this. The blueprint came from Brendan Rodgers last Christmas, when Liverpool were without Daniel Sturridge. In that game, the front three of Luis Suarez, Phillippe Coutinho and Raheem Sterling blitzed City with their pace and diagonal passes, exploiting the slow pace of Vincent Kompany and Joleon Lescott. Although Liverpool did go on to lose that game after they had their goal disallowed for offside, that tactic worked wonderfully. If dropping Ozil is too extreme (knowing Arsene, it is), Arsenal could take a page out of Jose Mourinho’s book. In 2010 when he was managing Inter, Jose Mourinho often lined up with Wesley Sneijder as his highest attacker. (He did this sometimes at Madrid with Ozil, too.) While that tactic involved Inter in a low block of defenders behind Wes, Arsenal doesn’t have to do that here. Where Arsenal could modify this is by taking advantage of Alexis Sanchez and Danny Welbeck’s defensive skills. As soon as Arsenal lose possession, they go into a diamond shape with Alexis joining Danny up front to press the City defense. If City manage to break the initial press, Welbeck and Alexis can track back, leaving Ozil as the highest attacker on the field. This entry was posted in English Premier League, Tactics and tagged Arsenal, Arsene Wenger, Danny Welbeck, Manchester City. Bookmark the permalink.